To pair with each gift idea, we’ve included its “Perfect Rustic Match,” a Rustic Pathways program that corresponds with that item. If you’re still considering programs, review the list to see if the gift and it’s match is the right fit for you, or for your teen. LifeStraw is the tool of choice for any traveler interested in backcountry adventures, long camping trips, or treks through rural landscapes. The microfiltration system removes 99.99 percent of waterborne bacteria and is perfect for ensuring safe drinking water for more than 1,000 gallons of water with proper care and maintenance. We also love gifts and companies that give back—for every LifeStraw purchase, the company provides a school child in need clean drinking water for an entire school year. Perfect Rustic Match: Tanzania Clean Water Project. Any gift that also provides clean water to a child in a village is going to blend well with our program in Tanzania. 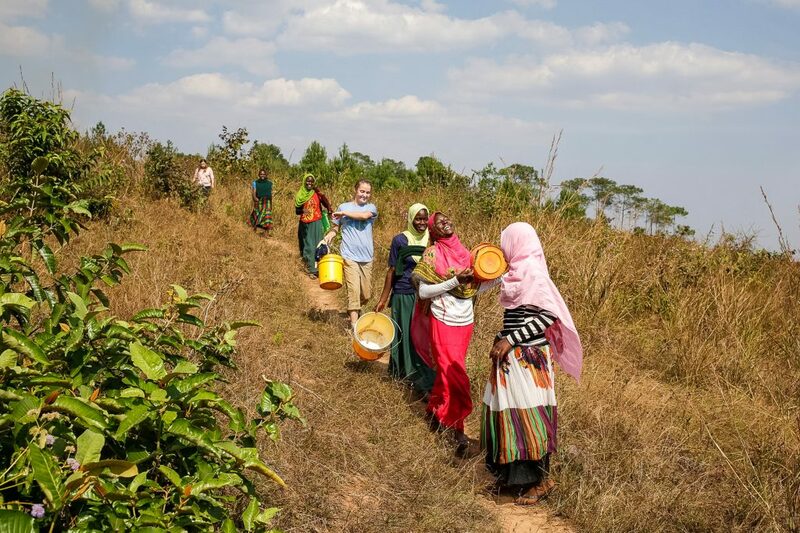 This program in East Africa is one of our Critical Issues programs about improving access to clean water, sanitation, and hygiene issues in the community. Don’t worry, we’ll have filtered water for students throughout the program, so no need to bring your LifeStraw with you on this trip. This isn’t just any regular t-shirt. It’s a lightweight and breathable cotton shirt made from an eco-friendly process that repels liquids, stains, and odors. It’s a welcome addition to any frequent traveler’s bag who wants to pack light and get more mileage out of their clothing and spent less time during their trip doing laundry. Perfect Rustic Match: Off the Map: Cambodia. This is definitely a trip that you’ll want to pack light for as you move frequently around the country. Having a shirt that you can wear for a couple of days on the jam-packed itinerary without having to worry about washing is a huge plus. And, not only will it repel sweat and odors, but it’ll also repel dirt and grime that would otherwise cling to it during service work at a local elementary school. And the breathable fabric will keep you cooler as you explore Angkor Wat. Just because you don’t have a DSLR camera doesn’t mean you can’t take great photos. Smartphone cameras have come a long way over the years, not to mention they’re a lot easier to pack. This clip-on lens works with iPhone and Android phones and allows you to capture wide-angle or even macro photos. It’s easy to pack, clip-on, and use to get those Instagram-worthy shots you’ll post on your way home that will undoubtedly make your friends and family jealous. Perfect Rustic Match: Come with Nothing: The Mekong Expedition in Thailand and Laos. On a program where you pack only what you can bring in a small carry-on, it might be best to leave the heavy camera behind. Instead, pack light for this three-week rustic adventure through Thailand and Laos where you’ll experience what it’s like to live simply with local families and assist with service projects in the villages. When reaching your destination, no one wants to lug every piece of clothing and toiletry with them for a day hike or afternoon trip to the beach. This ultralight packable backpack is easy to store in your checked bag and then unfold for your day-trip to carry essentials like sunscreen, water bottle, and sunglasses. It also works as an easy backup option if you’re hoping to return home with some souvenirs and need an extra bag. Perfect Rustic Match: Sacred Valley Service in Peru. Having a packable backpack on this program would be useful for taking what you need for that day’s community service to provide access to clean drinking water to several villages in the Sacred Valley. You’ll also be able to use the backpack on day hikes in the Sacred Valley and among the ruins of Machu Picchu. This headphone splitter keychain works with any portable device with a 3.5mm headphone jack (Smartphones, iPads, etc.) and is the perfect way to share media with an old or new friend. Just keep this clipped to your keys and you’ll always be prepared to share music or a movie. About the size of a key, you’ll barely notice it’s there. And the keychain is made with a durable material that makes it impact resistant. Perfect Rustic Match: Sun, Sand, and International Service in Fiji. Rustic travel experiences really start at the airport where you’ll meet other students traveling to the same destination country. You’ll have plenty of time to bond over music and movies on your way to one of Rustic’s farthest-flung countries. Listen to music or watch a movie with your new BFF with this keychain splitter. You’ll be glad you had it. Enroll in a Rustic Pathways program by Dec. 24 and get a free hoodie as part of our Unwrap Rustic holiday promotion.